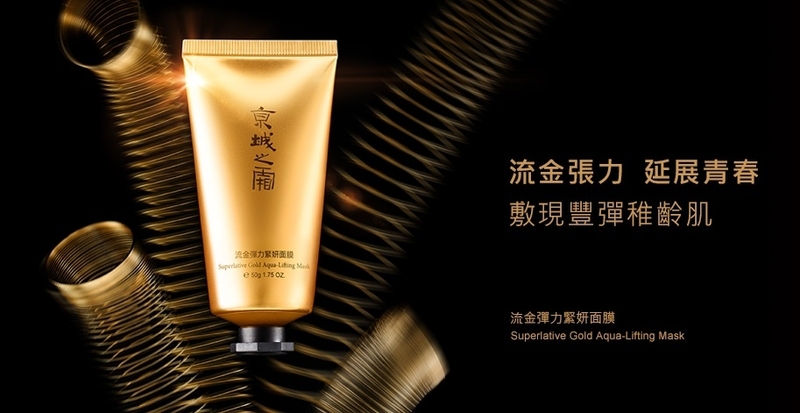 Superlative Gold Aqua-Lifting Mask 【京城之霜】流金彈力緊妍面膜 50g/1.75 OZ. The Superlative Gold Aqua-Lifting Mask is rich in super-concentrated gold essence and multiple firming ingredients to reinvigorate the skin and reduce signs of aging. The uniquely velvety, super luxurious golden gel-mask flawlessly seals and enriches every inch of the skin, and instantly activates the skin's natural revitalizing mechanism. Immediately infused with active ingredients of the revitalizing essence, the skin regains its youthful radiance and supple softness. Provides instant firming, reduces fine lines, and ultimately increases the skin moisture level. With rich luxury gel-like cream texture, it soothes and comforts the skin and helps to restore skin's elastic and silky touch. Apply a generous layer to the face after cleansing. Leave the mask on for 10-15 minutes, and rinse it off with water.